I’m excited to announce that I’ll be participating as a JumpStarter in Creative JumpStart (CJS) 2014, run by Nathalie Kalbach. If you’re not familiar with CJS, it’s a one-of-a-kind community event to inspire your creativity. Here is a SNEAK PEEK at what’s to com! Throughout January participants get 23 videos from 21 featured artists. I’m proud to be one of those artists. It’s an amazing event where you can learn new techniques, discover new materials, and connect with other Mixed Media Artists and Scrapbookers. Head on over to Nathalie’s site to sign up and for more details: http://www.nathaliesstudio.com/shop/online-workshops-ubermedia/creative-jumpstart-2014/ . CJS costs just $20 for the 3.5 hours of video content. That’s less than $1 per video — a great deal. great line up Pam. you’re wonderful at everything. 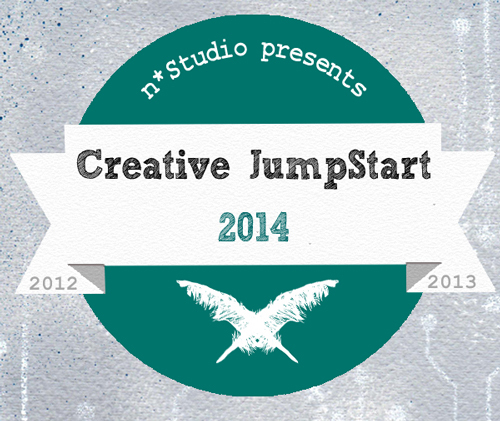 Hello Pam, thanks for your email, I just signed up for the Creative Jump Start 2014. I love your style, I’m so glad you will be in it! So glad you’ll be there! Yay!